Listener Gaumer wants to know what the MSP Crew thinks of comic book renumbering, which leads to Stephen ranting about the guy behind the counter at the local comic book shop. The incomparable Roger Langridge (FRED THE CLOWN) brings his absurdist humor to THE MUPPET SHOW stage! Longing for the swamp, Kermit forlornly plucks his banjo, while Miss Piggy, Fozzie, Gonzo and the entire gang tries to jolly him out of his funk. Packed full of madcap skits and gags, THE MUPPET SHOW is sure to please old and new fans alike. Confronting the demons of one’s past should be familiar ground for John Constantine. But some vicious memories are so horrible and buried so deep that digging them up could leave no one to pick up the pieces. “Who is Superwoman?” part 3! Supergirl continues her manhunt for Reactron, determined to bring him to justice for the heinous crimes he committed in “New Krypton”! This week it is a battle of the three apple high creatures that constantly foil their full sized foe. Who will win the battle between the blue Peyo creations, the Smurfs, and the Belgian knock-offs the Snorks? Out of the ashes of misfortune will rise the next generation of great adventurers! After their parents are lost on an archeological expedition, four children begin to unlock the secrets of their parentsâ€™ mysterious lives, discovering a hidden world of mystical artifacts, mythical creatures, and arcane knowledge. Soon they find themselves drawn into a conflict over a great library that has kept two kingdoms at war for centuries, the children must save an enchanted forest, the birthplace of magic itself. 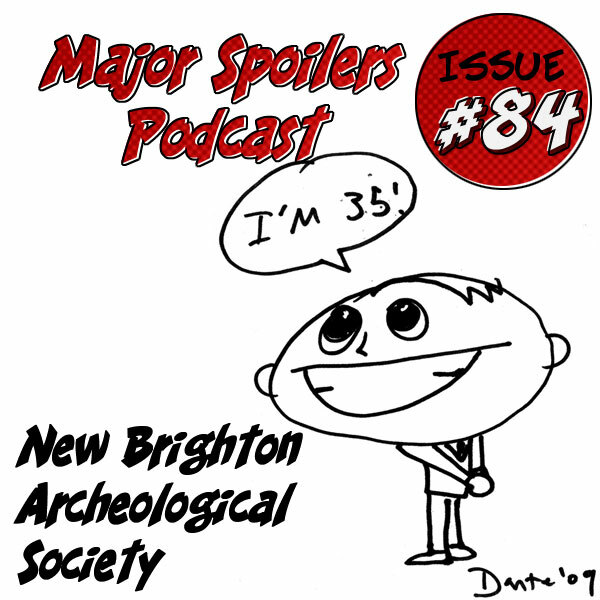 Join us as these children become the latest members of the fabled New Brighton Archeological Society, and take their first steps towards their true destiny! Michael Weatherly (Tony DiNozzo in NCIS) as Hal Jordan, it’s the only guy I see playing him, too bad Nathan Fillion is too old. Every comic book store I know has at least a small manga section and sells Magic, Yugioh and Pokemon cards. In fact here in Montreal one of the few places were you can get English manga is in a tiny comic book shop. Superwoman may still be kryptonian, she is seen saying her suit held up against the kryptonite blasts to some guy, he asked “what if it didn’t?” and she answers: “let hope we never find out” which means the blasts could have either killed her because she’s human (Daxamites wouldn’t have even felt it) or that she’s a Kryptonian after all. She’s working with general Lane because he knows who she is, which is big enough a secret to blackmail her into working (and killing) for him. I dread going to my LCS depending on who is there. Some people are okay, one guy is really nice, and there’s this one guy who is just a total douche. He always acts like I’m bothering him, and I guess I am interrupting his conversation and hang out time. But really, it’s gonna take 2 minutes to ring me up and he can get back to his gabbing. I go in and out as fast as I can because sometimes I am the girl that gets leered at. I know there is a great deal of elitism amongst some employees but a business is a business and in order to retain customers and profit, maybe they shouldn’t treat people like we’re all morons or annoyances. I’ve been in the corporate world for a number of years now and even if you don’t like someone, you have to be civil and respectful for the sake of the business. Anyway, thanks for touching on the subject. It’s something that bothers me to no end too. I would like to see Jensen Ackles from Supernatural as Hal Jordan I really like him in Supernatural and think he’d be good as Hal. My LCS Tim’s Corner in Rock Island, Il never made me feel like I was wasting his time and I was new to comics 2 years ago. Should I still be reading Superwoman or does it matter for the New Krypton story.